Fruits are nutritious foods that contain fiber, as well as essential nutrients such as vitamin C, folate and potassium. The U.S. Department of Agriculture recommends that adults eat 1.5 to 2 cups of fruit per day. Although fruit may help with weight loss, a two-week, fruit-only diet would lack a number of essential nutrients and may not be safe for everyone. Check with your doctor before making significant changes to your diet. Increasing your fruit intake may help slightly with weight loss, according to a study published in Nutrition Research in 2008. The effect wasn't very large, however, as an additional 1.5 servings of fruit per day resulted in an extra pound or so of weight loss during the 6-month study. Some fruits are more likely to help with weight loss than others, according to a study published in PLOS Medicine in 2015. The study found that, in general, each additional serving per day of fruit led to an additional 0.5 pounds of weight loss over the course of the four-year study. Each additional serving of berries, apples or pears led to more than a pound of weight loss during the study. Thus, berries are one of the better options both nutritionally and in terms of weight-loss results. Fruits tend to be low in energy density, or calories per gram, so replacing other, higher energy-density foods with fruit can help you fill up on fewer calories and lose weight. For example, you can fill part of your bowl with fruit instead of cereal at breakfast or ice cream as a dessert to lower the energy density of your meal, resulting in eating fewer calories overall. Simply adding fruit to what you already eat won't help, as this would increase your total caloric consumption for the day. Although all fruits are relatively nutritious, some provide more vitamins and minerals per serving than others, making them better choices for weight loss when you're trying to get all the essential nutrients while eating less. The most nutrient-dense fruits include guava, watermelon, kiwi, grapefruit, cantaloupe, papaya, oranges, apricots, strawberries, blackberries, tangerines, raspberries, mangos, persimmon, starfruit and honeydew, according to the Center for Science in the Public Interest. Fresh fruit is preferable to dried or canned fruit, but all forms of fruit are nutritious and are better than eating junk foods when you'd like a taste of something sweet. Even when choosing the most nutritious fruits, it isn't possible to get all of the essential nutrients in an all-fruit diet. Fruits contain very little protein or fat, so an all-fruit diet is extremely low in these essential nutrients, and would also be low in certain vitamins and minerals, including iron and vitamin B-12. Following an all-fruit diet for only two weeks might not cause any vitamin or mineral deficiencies, though, as your body has stores of some nutrients, but following it for longer may have health consequences. For example, not getting enough of the essential fatty acids -- omega-3 and omega-6 fatty acids -- can interfere with brain function and vision, and may cause skin rashes. If you try to lose weight without consuming enough protein, you're likely to lose more muscle instead of fat. A study published in the Journal of the American Dietetic Association in 2008 found that low-protein consumption while on a weight-loss diet was associated with increases in muscle loss. You need the amino acids in protein to build more muscle and to repair any cell damage, so this isn't too surprising. If you don't get protein for your diet, your body must break down muscle to get the amino acids it needs. The high amounts of sugar in fruit may make an all-fruit diet unhealthy for people with diabetes, who need to watch their carbohydrate consumption. For example, 1/4 cup of raisins has about 33 grams of carbohydrates, about 25 grams of which come from sugar. A cup of mashed banana has 51 grams of carbs and 28 grams of sugar, and a cup of passion fruit has 55 grams of carbs and 26 grams of sugar. A cup of watermelon balls has about 10 grams of sugar and apples contain 10 to 13 grams of sugar per cup of sliced fruit. Eating only fruit to get all your daily calories means you'd consume a lot of carbohydrates and sugars. Lower-sugar fruits include starfruit with 5 grams of sugar per cup, and raspberries with 5 grams of sugar per cup. Other types of berries are also relatively low in sugar and carbs. Some people also have difficulties digesting certain types of sugars -- such as fructose -- and the sugar alcohols found in fruits. A review article published in Current Gastroenterology Reports in 2015 noted that while all of the healthy volunteers could absorb 15 grams of fructose without problems, only 20 to 30 percent of the volunteers could absorb 50 grams of fructose without experiencing gastrointestinal symptoms. These symptoms include diarrhea, gas, bloating and abdominal pain. Fruit juices, jams, dried fruit and canned fruit are particularly high in fructose. For fresh fruit, apples, star fruit, cherries, kiwi, watermelon and grapes are among the fruits with the greatest amount of fructose, with 4 to 7 grams in 3.5 ounces of fruit. In addition to fructose, the sugar alcohols found in some fruits, such as watermelon, can also cause gastrointestinal symptoms if eaten in excess. Overall, the effects of eating only fruits, every day for two weeks, could result in tummy troubles for some people. Fruit can play a prominent role in a balanced weight-loss diet. Because fruit can be filling, eating fruit in place of other less filling foods may make it easier to cut calories for weight loss. A serving of fruit typically ranges from 40 to 120 calories, with starfruit and strawberries on the low end of the scale, and raisins, dates, bananas and persimmons on the upper end of the scale. 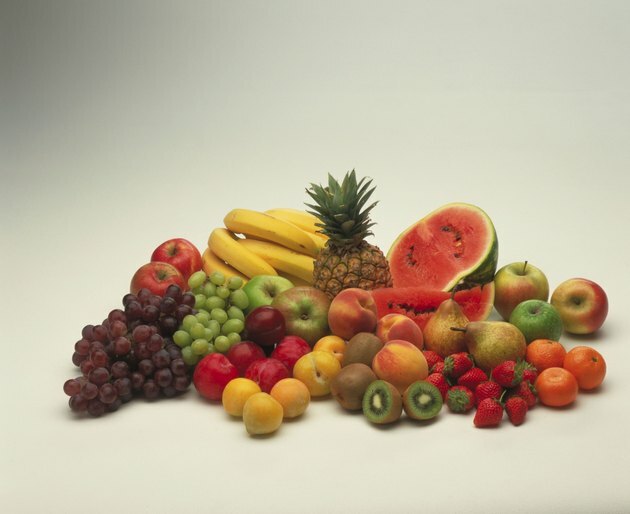 An all-fruit diet may be too low in calories to maintain your metabolism, however. You need to create a calorie deficit of 3,500 calories for each pound of weight loss, so you can lose about a pound per week if you eat 500 fewer calories each day. Women who eat fewer than 1,200 calories per day and men who eat fewer than 1,800 calories per day risk decreasing their metabolism, which makes it more likely they'll regain any lost weight once they go back to eating normally. The healthiest way to lose weight is to eat a balanced diet that consists of a mix of mainly whole foods, such as fruits, vegetables, dairy, healthy fats, whole grains and protein-rich foods, while limiting the amount of processed, fatty and sugar-filled foods you eat. For the best results, add about 300 minutes of cardio and two strength-training workouts each week. The cardio helps you burn more calories, and strength-training builds more muscle, both of which aid weight loss. Muscle burns more calories than fat tissue, even at rest, so it's helpful to increase muscle mass when trying to lose weight. But cutting calories without performing strength training can cause you to lose muscle instead of fat. CNN: What's the Danger of an All-Fruit Diet?